At Advanced Dental Health, we offer dental fillings to restore the health of your teeth and prevent cavities at our Phoenix, AZ, practice. You may benefit from this conservative restorative treatment if you are suffering from minor to moderate dental decay. There are several types of dental fillings offered and you can choose from metal or tooth-colored composite restorations. With a filling, your dentist can stop the spread of decay before it compromises the structural integrity of your tooth. A dental filling can be a good option if you have a small- to medium-sized cavity in your tooth. Larger areas of decay will typically require a dental crown or other restoration. We will carefully examine your tooth and take x-rays, as needed. Then he or she will decide whether a filling is the most effective way to save your tooth. Our dentists can also replace old, damaged, or discolored fillings, if desired. Your treatment will begin with a comprehensive consultation. At this time, the doctor will explain your filling options and help you choose the right material for your goals. For many years, metal fillings were the only option available, and we still offer gold and silver amalgam fillings, as they can be an effective choice. Thanks to their incredible strength, metal restorations can be especially beneficial if you have cavities in your molars. We offer different types of fillings to suit your needs. We also offer tooth-colored fillings for a more natural-looking appearance. Composite resin comes in a wide variety of tones, and we will choose one that is virtually identical to your teeth. 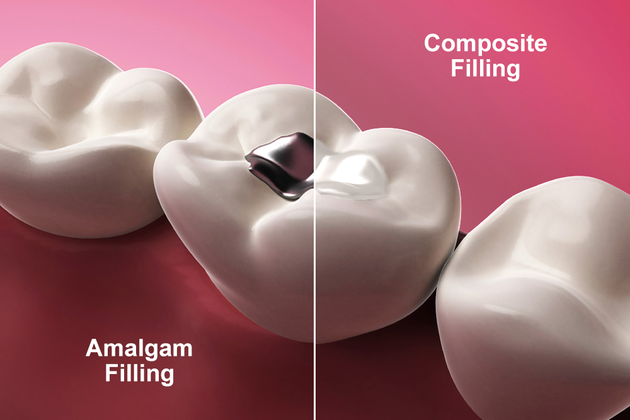 In addition to the aesthetic advantages, composite fillings offer a number of practical benefits. They form a stronger bond with your teeth than metal, and do not expand and contract with changes in temperature. Before placing a filling, your dentist will numb your tooth, then remove bacteria and decayed tissue. Through this process, your dentist will also reshape your tooth to make room for the restoration. After the initial preparatory work, your dentist will place the filling. If you are going to receive a composite restoration, he or she will apply the material in layers, using a curing light to harden each coating. When the filling is in place, your dentist will trim off any excess material. Then he or she will clean and polish your tooth. Dental fillings can have many long-term benefits for your oral health. If you do not seek timely treatment for dental decay, the cavity will grow larger, and eventually could destroy most of your tooth. This condition requires a more extensive restoration, such as a crown. In some cases, you could develop a dental infection, requiring root canal therapy or even extraction. With a filling, your dentist can stop the spread of decay before it compromises the structural integrity of your tooth. In addition, the material will fortify the walls of your tooth, helping restore functionality and prevent further damage. With different types of fillings available to their patients, we will work carefully to ease your discomfort and preserve as much of your tooth as possible. If you are suffering from dental decay, contact Advanced Dental Health to find out if a filling is the best treatment for you.